This Console Table was designed by Ruhlmann in 1929, for Yardley, is both exceptional in craftmanship and engineering. The top and shelf , which we hand plane, is finished in black lacquer and is reminiscent of the streamlined wings of an aircraft. 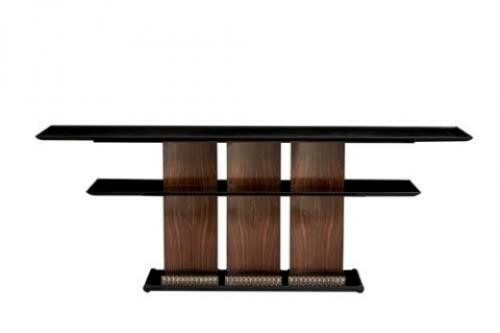 The veneered concave pillars reflect the finest quality book-matched Macassar Ebony. Silvered bronze mounts sit on a recessed double scroll base. Called the "Yardley Table"